ESPN presenter Erin Andrews isn't doing much to shoo away those rumors that she and her "Dancing with the Stars" partner Maksim Chmerkovskiy are an item. 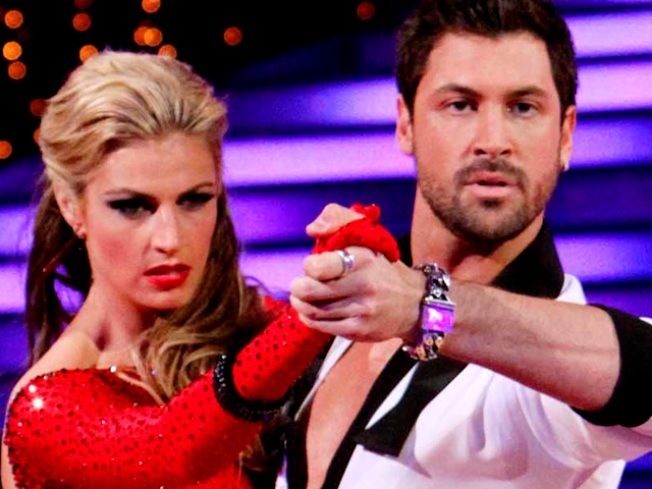 On Sunday night, the leggy blonde shared her emotions – and used the "L" word — about being Maks' partner via Twitter. "i wouldn't be this far in the comp if it wasn't for @MaksimC," she Tweeted. "love you Russian..hope to keep it going after tom night." Erin went on to thank the show for "giving me my smile back," no doubt a reference to life after her stalker was sentenced to two and a half years in prison, a sentence that happened just before the "Dancing" competition began heating up. "Dancing with the Stars" returns to television on Monday night with its semi final round and Erin is among the remaining stars vying for the mirrorball. While Pussycat Doll Nicole Scherzinger is seemingly running away with the competition with her partner, Derek Hough, Erin was given some hope last week. Judge Carrie Ann Inaba told Erin that there was just one reason she wasn't competing toe for toe with Nicole. "The reason why you're not is because you doubt yourself," Carrie Ann said. In related Erin and Maks news, according to an opinion piece in the New York Times last Friday, Elena Kagan, President Barack Obama's pick for the Supreme Court is a "Dancing" fan. Columnist Maureen Dowd who knows the Supreme Court pick wrote that people shouldn't "bother trying to get [Elena] out for dinner on a Monday night when 'Dancing with the Stars' is on. Her heart belongs to Maksim Chmerkovskiy's abs!" PLAY IT NOW: Are Erin Andrews & Maksim Chmerkovskiy Dating?